For many new Canadians, having affordable, stable housing is vital to their successful transition to Canada. Displacement due to gentrification can threaten that essential foundation. “Some landlords don’t act in good faith. 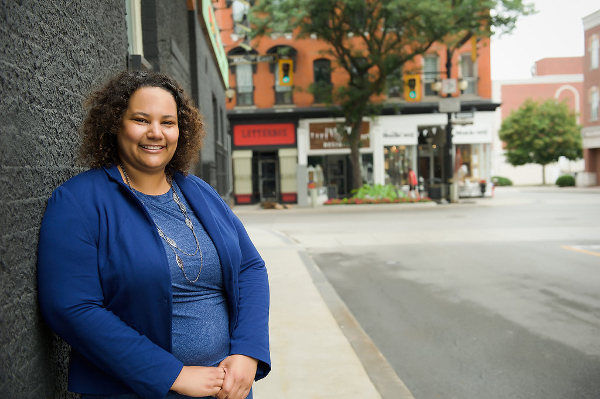 And, as many tenants simply don’t have the knowledge or tools to advocate for themselves, they often just leave when asked to and then find themselves priced out of the neighbourhood,” says Cassandra Roach, Project Coordinator of the [Dis]placement Project. The [Dis]placement Project provided training on housing law to community leaders, emerging community leaders, and service providers who support new Canadians in the Riverdale and Beasley neighbourhoods of Hamilton. The project was an initiative of the Social Planning and Research Council of Hamilton, Hamilton Community Legal Clinic, and Core Collaborative Learning and was funded by The Law Foundation of Ontario, through its Connecting Communities granting program. This partnership between legal and community organizations was designed to improve the capacity of frontline workers so they can provide basic legal information and referrals to their clients. These service providers work at organizations whose missions are not to provide legal advice or representation. And yet, their clients trust them and they are often the first, and sometimes only, people their clients approach with a legal problem. They become trusted intermediaries between their clients and the law. The workshops were designed and delivered using adult education best practices, like interactive exercises and case scenarios. They covered information about the Residential Tenancies Act, such as low fault and no fault evictions, maintenance and repairs, and above guideline rent increases. They also included details about municipal bylaws and zoning and how to properly complete certain forms and documents. Marla says they covered everything from filling out a maintenance request and writing demand letters to landlords, to understanding how to spot errors in eviction notices. And, workshop participants learned when an issue should become a referral to the legal clinic. Evaluations from the [Dis]placement Project found that the training had a direct and positive impact in helping people connect with the legal services they needed. So far, there has been a 30% increase of service providers directing new Canadians to the Hamilton Community Legal Clinic. “There was a marked increase in the confidence of the people who attended knowing that they could now better support their clients affected by displacement,” says Cassandra. Deanna Burns also attended the [Dis]placement Project training sessions. She supports families through housing issues as the Landlord-Tenant Navigator at Good Shepherd in Hamilton. That was the goal of training the trusted intermediaries, says Cassandra.